This week’s reading was very much focused on the Brian Williams controversy, mostly because I think that a lot of interesting and important questions about news production are being brought up in relation to it. There was a lot of news this week, so I was caught up in that rather than the more human interest pieces that I was reading last week. 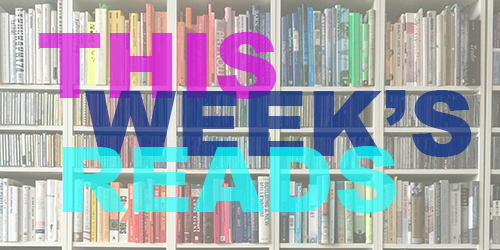 What did you read this week? Did you find anything interesting among my choices? The Instagram account affecting our view of climate change, 640 px at a time– Since social media is a large part of my job, I’m often drawn in by headlines about social media platforms. Mix social media and activism and you’re directly in my interests. I love this use of Instagram because is impactful, it gets people active and involved in an easy way and its reaching a lot of people. Make sure to check this out. Hate Crime Or Parking Dispute? Killing Of 3 Muslims In N.C. Sparks A Debate– This has been one of the biggest stories this week, though many are criticizing mainstream media for not covering it fast enough. The questions of what caused these tragic murders a huge deal because it is either a hate crime or an unrelated escalation of a parking dispute. I liked this article because it covers both fairly. I do not think it’s the job of the media to be naming an official cause of this crime, at least yet. The story is very sad and unacceptable either way. We need to start thinking/talking about the way that anti-Islamic sentiments are prevalent in our country, because it’s not working. Kings of Their Crafts, but on Divergent Paths: Brian Williams’s and Jon Stewart’s Common Ground– Media news is big this week, not only because of the Brian Williams scandal, which I read a lot about this week, but also because John Stewart has announced, rather suddenly, that he will be stepping down from The Daily Show. This comparison was very fascinating because of the way it contrasts the perceived strengths and weekends of traditional news vs. satirical news, which for the last several years has been trying to keep traditional news in check. Brian Williams Scandal Prompts Frantic Efforts at NBC to Curb Rising Damage– This is a nice overview of how NBC has gone about handling the Brian Williams controversy. Perhaps I am the only one who finds this all so interesting…. But this sort of case study makes you think about media companies work and how they respond when things go wrong. The Act of Rigorous Forgiving– So this is the last Brian Williams article, I promise. I read this several days ago, but it very much caught my attention. I think what Williams did goes against everything a journalist should do, but the author of this article brings a really interesting point about celebrity and the value of forgiveness, not so much in the personal or religious way I usually think about it but in a collective way. Read a letter written by Kayla Mueller last year– I was saddened with the whole country to hear that humanitarian aid work Kayla Mueller was killed after being a hostage in Syria. It broke my heart to read her beautiful, faith-filled letter after her death, but I think everyone should. I will remember this letter for a long time and use it as an inspiration. Sometimes we will have to make ourselves uncomfortable and even put ourselves in danger to make the world a better place and to care for our fellow humans. Kayla lived and died caring about others. What a legacy. Issa Rae told us about the secret to embracing your awkwardness and other brilliant things– As another self-proclaimed awkward girl, I am greatly looking forward to Issa Rae’s book “Misadventures of an Awkward Black Girl.” Us awkward girls gotta stick together and I enjoyed this interview as something fun and a little lighter than everything else.